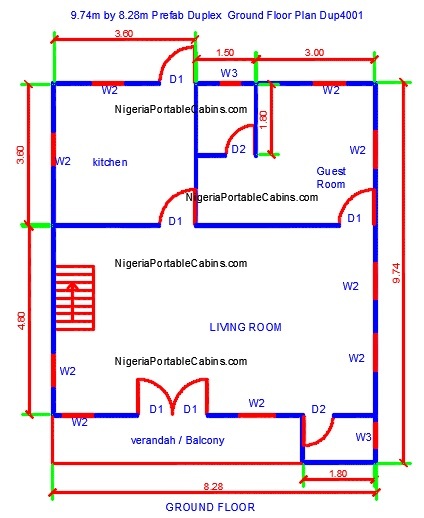 Duplex House Plans Nigeria - Free Duplex Floor Plans. Free Download. Looking for duplex house plans? Want duplex floor plans that reflect your sense of style? Scroll to the bottom of this page to see the custom duplex floor plan order form. What is the difference between using the free building plans we provide and ordering custom duplex plans? There are two obvious differences. To see the first difference, take a look at the sample free duplex house plan below. A close look at the sample free duplex floor plan above will reveal that the duplex plan carries advertising for our affiliate site, erimamaportablecabins.com. In simple words . 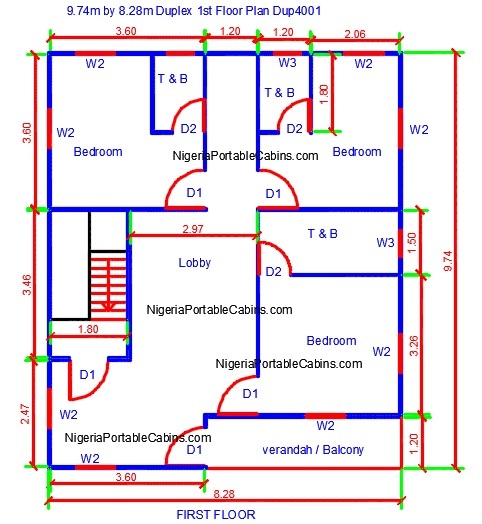 . . all free building plans shown on this site (and available in our prefab products catalogue) carry advertising for this site (NigeriaPortableCabins.com) or advertising for our affiliate site erimamaportablecabins.com. Why do these duplex plans advertise our prefab building web sites? The building plans belong to us. And we use them to promote our portable cabins and prefab homes business. Another thing to remember . . . we own the copyright to this images and building plans. But we allow our customers to use them free of charge. Now let's talk about custom designs. First, you get us to design your house to the exact set of specifications you want. Ordering custom duplex floor plans means that you tell us what you want included in the house and we draw all of those little exciting stuff you want in the duplex plans for you . . . exactly the way you want it and exactly where you want it. In practical terms, it means you do not have to make adjustments again and again to attempt to convert the free building plans you downloaded to suit your needs. Here's the second benefit of ordering custom duplex floor plans. When you order custom duplex plans designed to your high taste and style, you can do anything you like with the finished drawing or design. You can decide to . . .
Why can you do all of this? It's because it's yours! You paid for it! On the other hand, you cannot legally distribute or sell our free building designs because they're not yours. They belong to us. And we have exclusive copyright to them. If you attempt to distribute or sell our building designs, you will be violating our copyright. And that's a serious offense. You can either download our free duplex floor plans or order your own design. The good news is . . . we offer custom building designs and building plans at affordable prices. In fact, our custom building design prices are dead cheap . . . about the lowest in the Nigeria building design market. It's because we don't want anything to stop you from building your dream exotic duplex home. Ready to order a duplex design that reflects who you are and what you want? Fill the form below to order custom duplex plans. P.S: We do not offer duplex plans anymore. But we build prefab duplex for customers all over Nigeria. Want to build a duplex anywhere in Nigeria? Click HERE to request a quote.